This week features Page Lambert’s River Writing Journeys for Women as our highlighted women’s rafting adventure. A Colorado River trip, this six-day Cataract Canyon Adventure includes a spectacular scenic flight over Canyonlands National Park back to Moab. The theme for this year’s creative adventure, A River of One’s Own: A Heroine’s Journey into the World of Story, was inspired by Page’s special guest, renowned playwright and actress Ellen McLaughlin. Nature Inspires Creativity! Deep within the boundaries of Canyonlands National Park, Cataract Canyon offers a perfect balance between serene floating, incredible optional hiking, and fast-moving rapids. 300 million years of rock history, abstract sculpted sandstone spires, and ancient Anasazi petroglyphs and granaries grace Cataract Canyon. 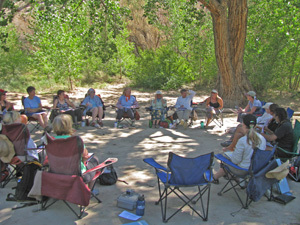 Creative discussions will take place at the river's edge and continue throughout the day, ending with readings under the stars. Featured in Oprah’s O magazine! Sheri Griffith Expeditions has been outfitting Page Lambert’s River Writing Journeys for Women for 17 years. 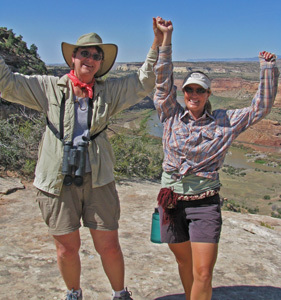 In 2006, Oprah’s O magazine featured these trips as “One of the top six, great all-girl getaways of the year.” Personal writing time is woven into the moments between floating down the Colorado River, optional hiking, relaxing on shore, and “circling up” with Page, Ellen, the other river women, and SGE’s fabulous women guides. Join the Heroine’s Adventure! Sunday night’s orientation at SGE is followed by dinner with Page, Ellen, and the other women guests. The trip launches Monday morning, August 11th. You’ll float down the Colorado River, past the confluence of the Green River, through beautiful Cataract Canyon, culminating with a breathtaking scenic flight from Lake Powell back to Moab. SGE provides everything—rafts, tents, sleeping bags, fresh healthy meals, etc. The fabulous women guides do all the cooking and rowing! Praise from Previous Guests of Page’s River Writing Journeys! “This is a fantastic trip! I have experienced Page’s women-only trips twice now and they are terrific. The Sheri Griffith company is excellent, the guides were super and both times the trip brought together amazing women. Rafting, hiking, camping, great food... a fabulous trip start to finish!" Do you have to be a writer? No previous writing experience is necessary for this adventure. Page will provide journals as well as written material for you to take home, and the river and the canyon will provide all the inspiration you need!